You may remember a while back I was freaking out trying to get my house cleaned for a magazine photoshoot. There was lots of toing and froing but in the end the green light was given and this week it was published. I got a 4 page spread in the national magazine Prudence, which is mostly geared towards professional woman and yummy mummies working on a budget. It was a really exciting opportunity and I'm delighted now that it's out. During the process of doing a thorough clear out of my house to make it look magazine pretty it was hard to see an end in sight. It seemed like I had so much clutter and that I would never get it done. I'm really delighted I persevered and went to the bother. My house mate Cecily was great with the finishing touches and helping to make the place look more girly and stylish. The interviewer/photographer Alexia McInerny was such a pleasure to work with too, she really put me at my ease and it wasn't nerve wrecking at all. She did a stunning job making my house look glossy mag posh too!! I don't have my scanner at the moment so I can't show you the piece itself but I can give you a peek at this contact sheet of images that she sent me a while ago. If you would like to see the article itself you can get a copy of Prudence Magazine in any good newsagents or in any Easons nationwide. Ooh how exciting! Great photos! I love sweets in big glass jars. How cool is that! Well done! It looks/reads great - I've got the same plant teacup (birthday present, but my house isn't worthy of it yet) Well done! that is well worth celebrating - hoorah for you! Phantastic!!! Your place looks so stylish and creative! 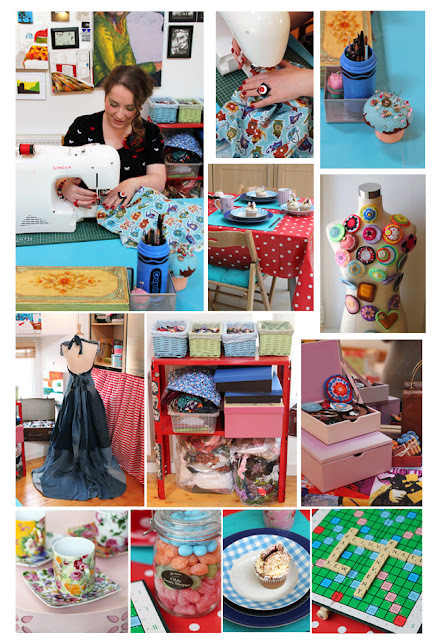 Very nice feature, Ruth - it's beautifully colourful and gives an air of such happy industriousness.